Id: Id of the node. It should be unique also. Name: Name of the node. Terminate: Terminates an entire process or just a path. Id: Id of the node and is unique. 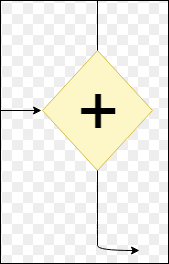 RuleFlowGroup: It represents the set of rules. Constraints: They are linked to the every outgoing connection. AND: The control flow of the process will continue to all outgoing connections at the same time. XOR: It selects exactly one outgoing path. This decision is made by some predefined constraints in the workflow. OR: It selects only that path from all outgoing connections whose condition evaluates to true. AND: The control flow continues after completion of all incoming branches otherwise wait for completing of incoming branches to continue. XOR: The control flow continues when at least one of its incoming branches has been completed. OR: The control flow continues when all direct active path of incoming branches has been completed. ProcessId: Id of the process that will be executed. Wait for completion: By default it is true. The sub process will continue if the child process that was started is terminated its execution. Otherwise, it will continue after starting the sub process. Independent: By default, it is true. In this case, the child process will not be terminated if its parent process is completed. It is false only when "Wait for completion" is set to true. 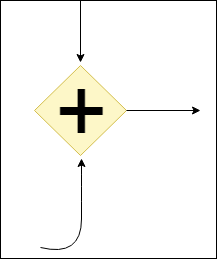 On-entry and On-exit action: It is executed on the entry and exit of the node. 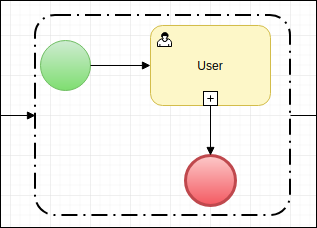 Parameter In/Out mapping: Sub-process node define in and out-mapping for variables. It is a node which executes a simple piece of code. It has one incoming connection and one outgoing connection. It has the following properties: Id, Name and Action. This node sets the timer for the process. It triggers certain logic for a specified period of time or repeat an action at regular interval of time. It is used to throw an exception occur in the process. It has one incoming connection and no outgoing connection. It has the following properties: Id, Name, FaultName and FaultVariable. It is used to respond to the event during the execution of the process. It has one incoming and one outgoing connection. It has the following properties: Id, Name, EventType, VariableName etc. It is used to create a human task and is executed by the human actors to complete the process activity. It has one incoming connection and one outgoing connection. It has the following properties: Id, Name, TaskName, Priority, ActorId, GroupId, Content, On-entry and On-exit action, Parameter mapping, Result mapping etc. It is used to create a child process within a parent process. It is very useful for the larger process. A sub-process has one incoming and one outgoing connections. It has the following properties: Id, Name and Variable. It allows us to execute the instance of a process segment multiple times, and at least one time for each element in a collection. It has one incoming and one outgoing connection. It has the following properties: Id, Name, CollectionExpression, VariableName, CollectionOutput, OutputVariableName, CompletionCondition etc.